When Guo Shuang competed at the Laoshan velodrome during the Beijing Games she had the weight of the host nation on her shoulders as she chased China's first Olympic gold medal in the sport. That pressure proved too much as she fell in her semifinal heat and thus the country's golden dream was crushed. Two years on, and China's hopes of finally breaking through and winning gold at the London Games are much stronger thanks to a more experienced Guo and a number of compatriots who are now capable of keeping up with the 23-year-old at top-class competitions. At the UCI Track Cycling World Cup in Beijing over the weekend, China topped the medal tally for the first time with five gold, one silver and one bronze. Guo claimed her first women's sprint world title while teammate Lin Junhong finished third. "This is my first sprint world title. It's a new start for me and will surely build up my confidence for the London Olympic Games," said Guo on Friday, after winning her final against Anna Meares of Australia, the woman who knocked her out in the semifinals at the Beijing Games. Guo, the three-time women's keirin World Cup champion and winner of last year's World Championship in that event, also validated her keirin supremacy by claiming the gold on Sunday. The women's keirin has been added to the 2012 London Olympic Games, so that is further cause for local optimism. 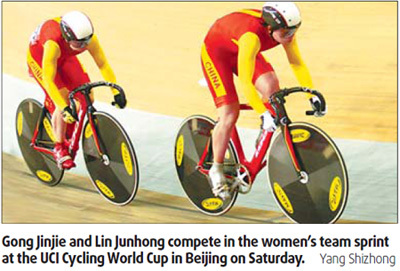 Meanwhile, Lin and teammate Gong Jinjie triumphed in the women's team sprint, another newly-included Olympic event. It was their second successive title at the World Cup, following victory in Melbourne in November. "It is only the second time we have teamed up and we won our second gold medal. I'm so happy we made it," Gong said. "But I know we are still not in top form. We need more cooperation and to face tougher competition," she said. "Our ultimate goal is to win the gold medal at the London Games. There are only two years left for us and we will work hard to make that come true." The Chinese men also delighted the home crowd as Zhang Miao won the 1km time trial and then led China to the team sprint championship. Daniel Morelon, the team's coach since 2007, was pleased with China's flying start to the new year. "I'm quite satisfied with the performance of the whole team, boys and girls. They have certainly reached my expectations. What's more important is that they are getting the experience needed for the 2012 London Games," Morelon said. The French coach also praised Guo for her growing maturity and consistency. "I think she (Guo) did a very job here. In the past, she has had some small faults but now she is riding more strategically," he said. "Of course, there is still a lot for her to improve on. We will continue to focus on lowering her errors in world-class competitions." Meares, the silver medalist in the women's sprint at the Beijing Games, considers the Chinese cyclists to be strong rivals but she sees Britain's Victoria Pendleton, who defeated her in the final at the Games, as her biggest threat. "Pendleton is still my biggest opponent but China also has very experienced ones and the young cyclists are learning very quickly," she said. The absence of Pendleton and some other elite cyclists during the leg made Song Xiang, the captain of China's cycling team, cautious about the team's achievements at the three-day event. "We have to notice that not all the best sprint cyclists were here. Australia didn't send their best sprint squad, either. We are looking forward to further proving our strength at the World Championships in March," Song said of the event in Copenhagen, Denmark.